While a bit slimmer, Trijicon’s 300 AAC Blackout model shares many of the same features that made ACOG’s so popular. The 300 AAC Blackout caliber is a nightmare for optics manufacturers. Why? The range of possible projectiles and associated ballistics are crazy. 300 Blackout can be a flat shooting cartridge using a light bullet at 2,500 feet per second. It can be a thrown-brick projectile weighing 245 grains and traveling at 950 feet per second. It can also be just about anywhere in between those extremes. Like classic ACOG’s, the 300 Blackout model features dual illumination sources: fiber optic and tritium. Imagine trying to design an optic with ballistic drop compensation (BDC). In plain English, BDC simply means that the reticle is pre-marked to show the hold point for a given distance. For example, if you’re shooting at a target 200 yards away, you just hold the 200 yard reticle mark on the target, and you should make a hit. That’s great in theory when you have a caliber with fairly standard performance over distance like the .223 Remington 55 grain projectile. When a caliber can fire a range of bullet weights ranging from 90 grains to 245 grains, things get tricky. To put that in perspective, if you shoot a 300 Blackout cartridge with an 110 grain Barnes TAC-TX projectile, traveling at 2,500 feet per second, it will drop about 64 inches at 400 yards, assuming a zero yard zero. If you do the same thing with a 220 grain Sierra Matchking traveling at 1,050 feet per second, that bullet will drop almost 278 inches over the same distance. The difference in drop between two difference loads in the exact same caliber is a whopping 214 inches. That’s 17.83 feet. To put that in visual terms that’s equivalent to 3.147 Michael Bloomberg’s stacked on top of each other or 4.13 AMC Gremlins. Sorry for two entirely different, yet equally scary, visuals. The 30mm objective lens provides plenty of light. Trijicon has taken a whack at this ballistic challenge by using a single reticle, but marking it with realistic and common hold points for both extremes of the 300 AAC Blackout performance range. We’ll get more into that in a minute. Like other Trijicon ACOGs, the 300 Blackout model is a fixed power magnification design. This one offers straight 3x magnification, which is plenty sufficient for realistic subsonic and supersonic ranges. The fixed magnification means no zoom rings or controls and generous eye relief, so it’s really fast and efficient. Also like most other Trijicon optics, it’s designed to use the Bindon aiming concept. In Trijicon’s words, “Human vision is based upon a binocular (two eyes) presentation of visual evidence to the brain.” In plain English, that means keep both eyes open. Your brain does magic brain stuff and you see your target with reticle superimposed. The reason is that the Trijicon uses a bright reticle, which allows your brain to merge the target image from your outside eye with the aim point visible through your “scope” eye. Like other siblings in the ACOG family, this model has a dual illuminated reticle. The distinctive fiber optic tube across the top collects light to amplify the aim point when ambient light exists. An internal tritium lamp provides illumination in low light and pure dark conditions. No controls to turn on or adjust, you just use it, regardless of light conditions. My evaluation model came with a green reticle, but you can also choose amber or red if you like. The green reticle shows up plenty in broad daylight. In low light conditions, the visibility is even better. For initial zeroing, the optic has two removable caps that cover the windage and elevation dials. Using a dime, empty cartridge case or screwdriver blade, move the dials as needed. Each click will adjust the point of impact by ¼ inch at 100 yards.The arrows on the adjustment dials indicate the direction you want the bullet to move on the target. Simple. My unit came pre-centered and only required a couple of clicks of windage and elevation adjustment to match the point of impact of my Daniel Defense DDM4v5 300 AAC Blackout rifle. Windage and elevation adjustment dials are a one-time use affair, or whenever you significantly change your primary supersonic ammo choice. This ACOG includes a handy reference point on the reticle that simplifies zeroing. When installing on a new rifle, set a target at 25 yards. Instead of using the cross intersection as you would for a 100 yard target, use the pointed top of the long distance 300 meter post, which is the same as the top of the 50 yard subsonic diamond, as a hold point. If your shot impact matches that, the 100 yard zero using the cross above will be pretty close. Now move your target to 100 yards and verify that the 100 yard supersonic aim point matches point of impact. The reticle is simple, yet has both hold point (ballistic drop compensation) and basic ranging tools. It’s also parallax free so it works from zero to 600 meters without the need for parallax adjustment. The ballistic drop compensation features are clever in their simplicity. Rather than cluttering up your view with lots of marks, Trijicon has figured out how to make the few marks that are there multitask. For example, the primary aim point for 100 yards (supersonic ammo) is a free-floating cross. For 200 yards, there is not a separate mark, you simply hold on the bottom of the crosses vertical post. Horizontal hash marks indicate 300, 400, 500 and 600 yard supersonic projectile hold points. The Trijicon ACOG TA33 Blackout reticle. For subsonic rounds, there are two solid diamonds on top of the vertical bar: one above the 300 yard supersonic hold point and the other resting on the 400 yard hold. These are 50 and 100 yard holds for a standard subsonic round. I zeroed the Trijicon at 100 yards with 110 grain supersonic ammunition. Then I popped in a subsonic rounds put the 50 yard whole point directly over the bullseye on a 50 yard target. The very first shot hit dead center, so that was encouraging. The reticle also includes basic ranging indicators. The horizontal BDC marks vary in width to represent a 19 inch wide target. If a known object of 19 inches matches the width of one of the crossbars, there’s your range. If it’s in between two, you can guesstimate. The Trijicon ACOG TA33 300 Blackout model is a fast no-brainer solution. With fixed 3x magnification, there’s nothing to fiddle with. Raise your rifle, open your eyes and go. The two eyes open concept works great unless you’re cross-eye dominant and establishing aim is fast. The reticle offers enough granularity to hit reasonable sized targets out to a few hundred yards. For a tactical or home defense rifle, I do like the “always” on reticle lighting. In the daytime, the fiber optic tube makes the reticle glow brightly and in low light conditions, a tritium lamp lights it up. No batteries to run down and no switches to operate – it’s just on. Ever thought about reloading your own ammunition? 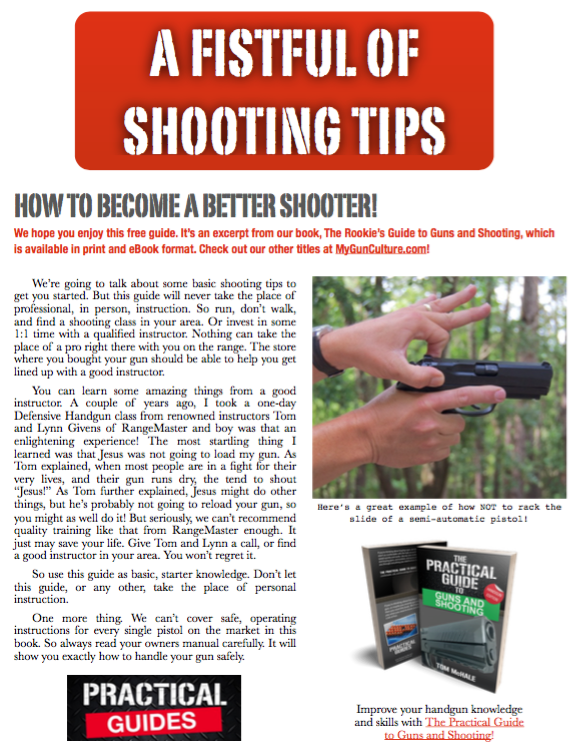 Then you might want to check out our new book, The Insanely Practical Guide to Reloading Ammunition. Practical, yet comprehensive advice and tips will get you started in no time! Tom, Great article. I just purchased a TA33-C-400164. The only difference between my purchase and the one pictured in your article is that my elevation and windage adjustments dials are not slotted. They are just knobs designed to be turned by hand. No tools required. I’m guessing it is a newer model? My primary question is this: The manual says the ACOG is calibrated for 115 Grain Supersonic and 220 grain subsonic ammunition. All I can seem to locate locally are 120 grain, 125 grain and greater (supersonic). If I zero with 120 grain ammunition, how much is that going to impact my holdover at distances out to 200, 300 meters or beyond? I want to get this thing zeroed, but I don’t want to zero with 120 or 125 grain ammunition just to discover it was wasted time and money. Thanks! Andrew: I have been researching the ACOG’s for my 300 BLK and just read an article on the Trijicon website describing the sights. It states that the supersonic BDC reticle points are placed to accomodate supersonic bullets in the 110gr-125gr range, and subsonic bullets in the 174gr-240 gr range. BUT, note that the BDC points are diamonds, not horizontal lines in their article (about the TA11-C and TA31-C sights). The top of each diamond is to be used for the lighter rounds and the bottom of each diamond for the heavier rounds. They may have changed the reticle since Tom posted this article in Sep, 2014. Thank you. I must have over looked that at the Trijicon site. I did know about diamonds, but the manual that came with the optic only specified 115 Grain for Supers and 240 for Subs. Thanks so much for replying, now I can have a warm and fuzzy feeling about using 125 grain ammunition without fearing it will significantly effect my POA/POI. If your a right handed shooter and left eye dominant can you still use the Acog with both eyes open? Thinking the brain is going to want to focus on the illuminated reticle?? If you can use an Eotech sight, or a standard rifle scope with your mixed dominance, you can use the Trijicon optic.